Mornings are always the worst when it’s time to get ready for work – especially in the middle of winter; you don’t want to leave your warm bed and head out into the cold weather, which, depending on where you are in the country, can vary from slightly cool through to freezing cold snow. Our Thermo Travel Mug range is perfect if your business is looking for a useful promotional tool to give to your customers and clients – they’ll be reaching for it to make a hot drink to take with them on the commute to work. Thermo mugs are a great all-round branded product and can be used as promotional giveaways, gifts, promotional merchandise or gifts to your staff and clients at the end of the year. With three different options, our Thermo Travel Mugs will be a great addition to your promotional product range. Each mug in this range holds 475ml (or 16 oz), and there are three different styles to choose from. This range is budget friendly and suitable to any business. 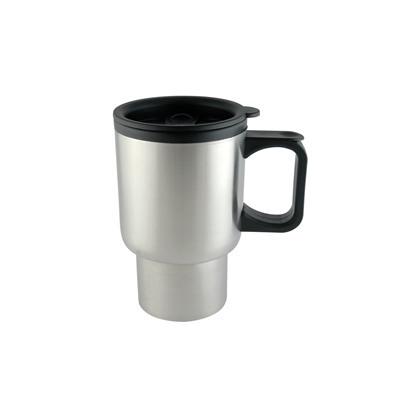 The 16oz Thermo Travel Mug has a classic style with a square handle. With three logo printing options – pad print, screen printing or laser engraving – these are a good choice when you need a branded mug for any occasion. Our second 16oz mug – Thermo Travel Mug 2 – features a large open styled handle and no-spill lid. This style tapers at the bottom, and is perfect for adding to gift baskets at the end of the year, or as branded gifts to your new clients. Thermo Travel Mug 2 also features three logo printing options – pad print, screen printing and laser engraving – which means you can get the look you want. The 475ml Thermo Travel Mug is another classic styled mug which looks great with a laser engraved logo print. This style is perfect if you are looking for a promotional merchandise item, and will look great in your café or take-away coffee outlet. This mug can also be pad printed or screen printed if you are looking for a bright branded mug. With winter quickly approaching, this is the best time to order your branded Thermo Travel Mugs and get them out to your clients and customers. Trust us – they’ll keep your brand in mind as you help them get going in the morning.